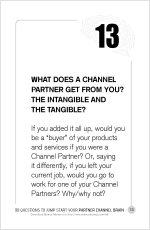 What are the tangible, intangible benefits Channel Partners get from you? Home → Uncategorized → What are the tangibles and intangibles Channel Partners get from you? What does a Channel Partner get from you? The intangible and the tangible? This question is a litmus test for all channel marketers. Just when you thought you could put everything into a spreadsheet and manage from a to-do list, along comes this question asking about intangibles. The stuff you can’t easily measure. In fact I’d say it’s impossible for you to measure it because you’re just too close to it. You know the players and the products all too well. Yes, you could hire a consultant to help you figure it out (shameful plug), but if I asked the question differently, you might be able to get to the answer on your own. If you added it all up, would you be a “buyer” of your products and services if you were a Channel Partner? Or, saying it differently, if you left your current job, would you go to work for one of your Channel Partners? For me, it assumes too much. It means dealing with others from your own perspective and not theirs. The implication is that “you” want the same things I want. You see this all the time in business. You win an attaboy award at work and your boss hands you a $25 gift card to Starbucks. Nice gesture… if you drink coffee. Or closer to home, you have a certification program for your Channel Partner’s technicians who demonstrate a level of competence and knowledge about your product line. What the technicians want (but never told you) is a way to show others what they’ve achieved, like a certification logo they can have printed on their business cards (you pay to print their new cards, btw… don’t chinse out!). This gets you to an A. Put out a press release acknowledging the freshly-minted, certified technicians. The press release will only set you back $400 on PR Newswire for a full US1 release (see: http://www.marketing-playbook.com/sales-marketing-strategy/cost-of-pr-newswire-pricing-prnewswire-discount-promocode). Have your photo taken with each newly certified technician, frame it and FedEx it to their office. Most of the time, an arriving FedEx box will create the office buzz you’re hoping to create. Don’t forget to include a personal thank you note! One sentence will do. Write a thank you note to the technician’s boss, assuming you know their boss. (see: http://venturemarketing.com/knowing-names-channel-partner-sales-reps/). Channel Partners may not remember what you said and did (frustratingly all too often for many of us), but they always remember how they were treated. Treating people (especially your Channel Partners) special is key to long-term relationships…and perhaps, the survival of your business. Intangibles do matter. Certainly, if you’ve created a positive environment for your Partners, focused on both the tangible and intangible, and have baked the Platinum Rule into your culture, then perhaps you would think seriously about joining your Channel Partners. This is one of your best! How do you find the time to keep this up to date? I’m printing these out each day on 3-hole paper and saving them in a binder.